This time of year, people will take time out of their busy schedules to celebrate the Thanksgiving Holiday and count their blessings. They create cozy settings full of abundant food, friendship and family. They travel great distances to be with loved ones, cook for days, and gorge on food and football. They say “Happy Thanksgiving” to people they know. Being grateful for the harvest in the tradition began by the founders happens this week in cultures in America and beyond. 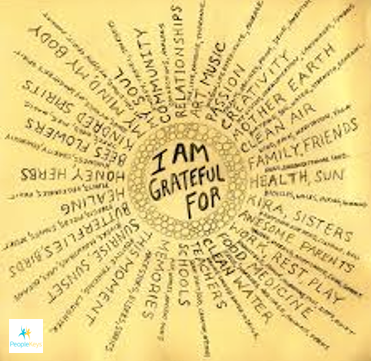 Sadly, for many, gratefulness is a one-time annual event. Yet, cultivating an “Attitude of Gratitude” is one of the few simple things we should all practice daily to grow personally and professionally. Instead of celebrating Thanksgiving on only one day, celebrate Giving Thanks each day. It may even change the way you look at the world. Life coaches who work with PeopleKeys know the power of Gratitude and will often advocate changes in attitude and outlook for personal growth. Each day, life hands us our share of challenges, unexpected crises, and suffering. While we are going through them, it’s difficult to see their value. But, it’s worth remembering that it’s not the events in our lives that shape us, it’s how we respond to the events. I have to consciously work on my own response to events, as certain personality styles, such as the “S” style, do not respond well to sudden change. The reality is, we have no control over the events in our lives, but we do have control over our responses to events in our lives. Each event has positive and negative aspects, sometimes we just have to search harder to find the positive. It’s a good habit to form, thinking consciously and purposefully, to making every day a thanks-giving day, especially when things aren’t going our way. This saying is so true, “Grateful people have much more to be grateful for.” Think about it. • Every morning give thanks for at least one good thing in your life. It’s been said it takes 21 days to create a habit, but more recent studies say it actually takes 66 days to create a habit. Regardless of your personality style, ongoing gratefulness will eventually become habit-forming. • Keep a Gratitude Journal. If you want to remember the people, events, circumstances in your life that make you thankful, write them down whenever you think of them. Read your journal when life is getting the best of you. Your written word will stand as a constant reminder of all of the aspects of your life you can count as blessings. • Once a day, think about a convenience that you have and give thanks for those who forged a way to make it possible. It could be a technological advancement, your favorite food recipe, freedoms of your country, or even your job. Think about the people who worked hard to make it possible. Who were the founders of your organization, what challenges did they have to overcome so that you could benefit by having a job and a decent wage? • Acknowledge others who have helped you, supported you, or inspired you. Don’t wait until a holiday to express yourself to them. Sometimes we fondly remember others during their eulogy, which is wonderful, but far too late. Make sure to think of others important to you and let them know how much they mean to you. • Put daily gratitude on your New Year’s Eve Resolutions list. In an effort to consciously remember daily gratitude, it may help to make it an official resolution, since the new year is right around the corner. Eventually, it will become a habit and hopefully won’t be forgotten quite as quickly as your weight-loss resolution! For a fascinating look at self-talk (like gratitude) and how it actually can re-wire your brain, watch Dr. Leaf’s TED talk on The Science of Thought, or for further motivation, read these 13 inspiring Gratitude Quotes. At PeopleKeys, we believe in the power of positivity and knowing yourself in order to grow yourself. Take a DISC test to learn more about your own personality style and the positive strengths you can bring to being thankful daily.